The April edition of the Southwood Park News is now available online! A direct link is here: SPN 04.12. You can access all back issues of the newsletter by clicking on the Newsletters link near the top of the homepage. 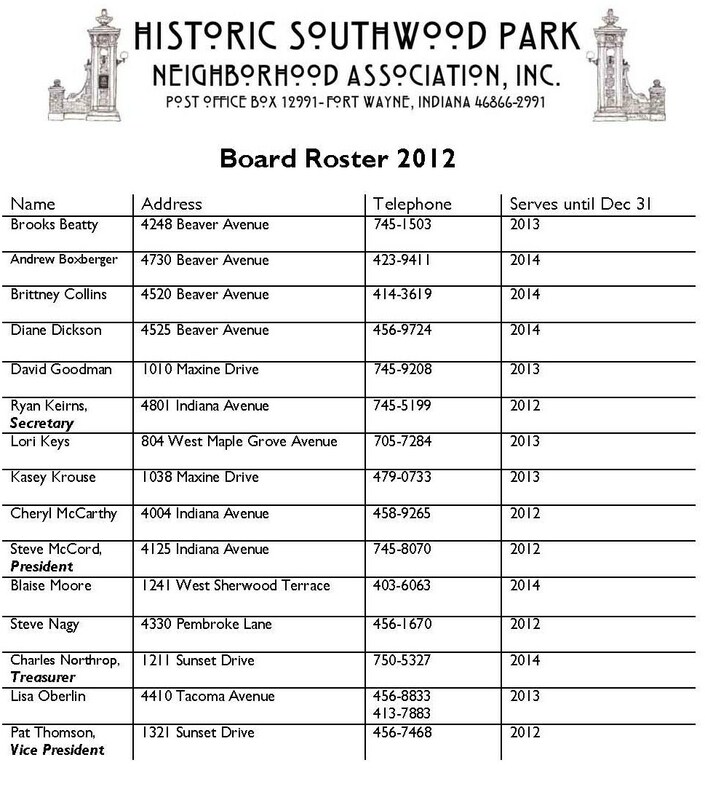 Stories include the updated Board of Directors roster and election results (pictured below), an overview of residents’ concerns from the year-end ballots, Dirt Day details, Garage Sale dates, August Block Party notes, and a notice about the Foster Park Centennial celebration that is coming in July. Paper copies of the April newsletter will be mailed in the coming days. While I am in the mode of getting caught up, let me post here that copies of recent meeting minutes, treasury reports, and agenda are posted on the Association Information page. Here are direct links to the most recent of them: SP Agenda 03.14.12, SP Treasury 03.12, SP Minutes 1.11.12, and 2011 Year End Treasurer’s Report. I noticed while walking on Rudisill Blvd in front of the Grace College parking lot entrance, a notice of a public hearing on April 19 about permission for a “neighborhood facility”. What does that mean? Will a member of our neighborhood association be attending that hearing? Big Brothers Big Sisters plans to use two floors of Witmer Hall for administrative purposes. There shouldn’t be a great deal of traffic. So far, we have only heard positive comments from neighbors. If anyone has specific questions, I will be happy to forward them to Seth Keirns, a BBBS board member and Southwood Park neighbor.